Following a heated discussion on Thursday, the New Orleans City Council voted in favor of requests to rename sections of two streets in Central City after prominent local pastors. The council members were mostly united in their desire to honor Bishop Robert C. Blakes of New Home Ministries on Carondelet and the Rev. John Raphael Jr. of New Hope Baptist Church on LaSalle, both of whom passed away in 2013. Likewise, the council members largely agreed that the city lacks a formal system for honoring notable citizens via its street grid. The issue that divided the council so sharply on Thursday, however, was whether to go ahead and rename the two street portions immediately, or whether to wait until that honorary system is created. Members of the two congregations were first to speak Thursday, and they were united in their insistence that the work of Blakes and Raphael in their neighborhoods merited the memorial. They were noted as role models to the neighborhoods, unafraid in their opposition to crime, steadfast in their devotion to their people, and a credit to New Orleans internationally for their service. “I believe these lives should be cemented in history as a reminder of how we should live and serve our community,” said Pastor Jamal Weathersby, who succeeded Raphael at New Hope. Opponents, however, said that they felt an honorary system alongside the traditional street names were better for the city. The Preservation Resource Center has been advocating for the creation of such a system for more than a decade, said Michelle Kimball, and the requests regarding Blakes and Raphael should jumpstart it. “This is the perfect opportunity for us to commend these men,” Kimball said. “We are asking you to develop a different way of honoring people than changing the names of our historic streets,” agreed a Central City resident. Only one person spoke against honoring the pastors, Jason Berry of the New Orleans Secular Humanist Association, partly because of the use of the pastors’ religious titles in the new street names. But he also said the men had “troubling” views about homosexuality, and said the city could one day view these new street names in a similar way to Palmer Park (which was named for a prominent racist pastor). Chris Otten, chair-elect of the Louisiana-based Forum for Equality, said in an interview after the meeting that his organization had requested a 30-day delay on the vote to research the issue. “We thought it was appropriate to request a delay in the vote so that we could give the Council a position reflecting the values both of the city and the LGBT community,” Otten said. Stacy Head, speaking first, said these renamings contradict city rules, such as a requirement that the person honored have been dead for more than five years, that no abbreviations or titles be used, and that contiguous streets not be broken up. Blakes and Raphael did much for the city, but “they lived in Kenner and Harvey,” and perhaps other New Orleanians such as Dorothy Mae Taylor (who spearheaded the integration of Mardi Gras) would be more suitable for honoring first. LaToya Cantrell, who represents the area and first asked the City Planning Commission to study the issue, said she supports honoring the pastors but outlined numerous concerns. Mayor Landrieu promised the renaming to the congregations during his re-election campaign, and allowing them despite their many contradictions with the rules undermines the system: “There is the possibility of politics trumping merit,” she said. Instead, Cantrell said she has become convinced of the need for an honorary system that would allow these men to be honored, as well as other great citizens. The honorary system would be a permanent change that would both honor the men and leave the original street names intact, she said, but she was disappointed with the other council members for moving forward with the change to her district. 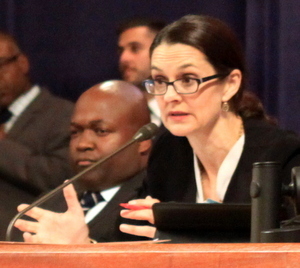 “I cannot vote for an ordinance that corrupted our process in a way that does not represent the standards of the two great men we are honoring today,” Cantrell said. 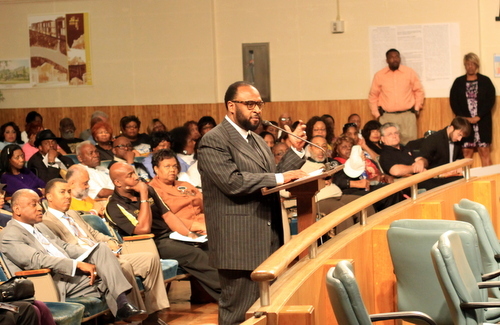 Susan Guidry, speaking more briefly, said simply that the two pastors were clearly great men, but she echoed Cantrell’s concerns: “Unfortunately, these ordinances go against the rules that we have,” Guidry said, and lamented the political concerns that seemed to be dominating the council vote. James Gray applied a touch of sarcasm to some of the practical issues that have been raised. Carondelet — which is the Spanish explorer’s title, not his actual name — will still be honored with a long street spanning much of the city, while Blakes’ name will only be on a small part of it. “I doubt if postmen are going to get lost in that four blocks,” Gray said. Not only do the people who live in that section of the street support the change, Gray said his most important reason for supporting the name change is for the kids who live there, who might see the street name, find out who it represents, and be inspired by it, Gray said. Nadine Ramsey said she had been committed to the renaming ever since it was first proposed by the congregations, and remains so with her vote in favor of it. “I am happy to honor them, and see the passion and the tears of joy in their congregations letting me know that this is the right thing to do,” Ramsey said. Jared Brossett said he looks forward to the Council moving forward with the creation of an honorary street name system, but for today will vote in favor of the renaming. Finally, Williams spared no words in response to Cantrell. He said that while some people pay lip service to renaming streets with names that many find objectionable, like Jefferson Davis Parkway, no one has made any effort to do so. Meanwhile, these congregations were promised the city’s support, he said, apparently in reference to Cantrell’s original request that the City Planning Commission take up the issue. With that, the council voted 4-3 in favor of the name change, and the packed audience erupted in cheers. To read more from Thursday’s meeting, see below for our live coverage. we’re having a crime crisis and this is how the City Council spends its time? I’d like to propose that 3 blocks of Freret St. should be renamed Uptown Messenger Way in recognition of the way UM has pulled us through the downward spiral in investigative journalism. Similarly, the blocks of Jeff Davis Parkway between Earhart and I-10 should now be named “Karen G takes no prisoners boulevard.” State St. in it’s entirety should also now be named “I pave my front lawn and ain’t nothing you can do to stop me Lane.” That will do for now.